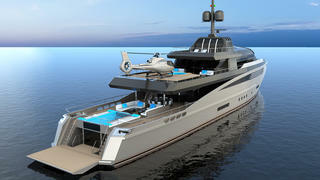 Italian yard Eurocraft has revealed details of two new concepts, the Eurocraft 46m and the Eurocraft 56m (pictured below). Developed in collaboration with Federico Fiorentino Designs of Milan, the two new yachts are described as having a “radical and contemporary” style. Both designs were governed by an overarching desire for maximum comfort during long periods at sea. As a result, total reliability and efficiency were also key factors. This can be seen on the Eurocraft 56m through its rugged, military-inspired exterior and the large crew quarters with room for a staff of 13 people. Accommodation is for 12 guests in six cabins, including an upper deck owner’s suite, complete with private panoramic terrace and enclosed gym area. A full-beam VIP suite is located forward on the main deck, while two doubles and two twins on the lower deck complete the guest accommodation. Entertainment options on the Eurocraft 56m are plentiful, with a swimming pool, beach club spa and a multifunctional VR room, which can be used as a cinema, driving range or shooting range. Tender storage is ample, with room for a generously sized RIB and a limo tender, while the upper deck also includes a superyacht helipad. The Eurocraft 46m (pictured above) features many of the key features of its larger sibling, with an aft helipad, sundeck spa pool and plentiful tender storage on the aft deck. 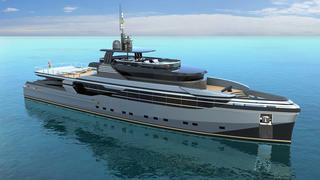 The yard adds that delivery times for the two new models are between 24 and 30 months from contract signing. Other projects currently under development at Eurocraft include a 44 metre new-build yacht that is currently offered for sale.